These are traditional full coverage chromoplastic fenders with stainless steel stays and rubber mudflaps. Fits 700c and 26" tires. In 37, 45, and 60mm widths. 37 and 45mm widths come in multiple colors. Choose something slightly wider than your tire's width to give you splash coverage. Colors: Gloss black, matte black, silver, pearl white, red, green, blue. The 'chromoplastic' construction means that these Soma Rain Dog fenders are crafted from a thin piece of aluminum foil which is then encased in a fairly hard yet still flexible plastic shell. The end result? A fender that is hard wearing and very resistant to cracking and gives the impression of a steel fender without the downside of steel, specifically its heavier weight and vulnerability to denting. These are well-made fenders, very durable and they look great. 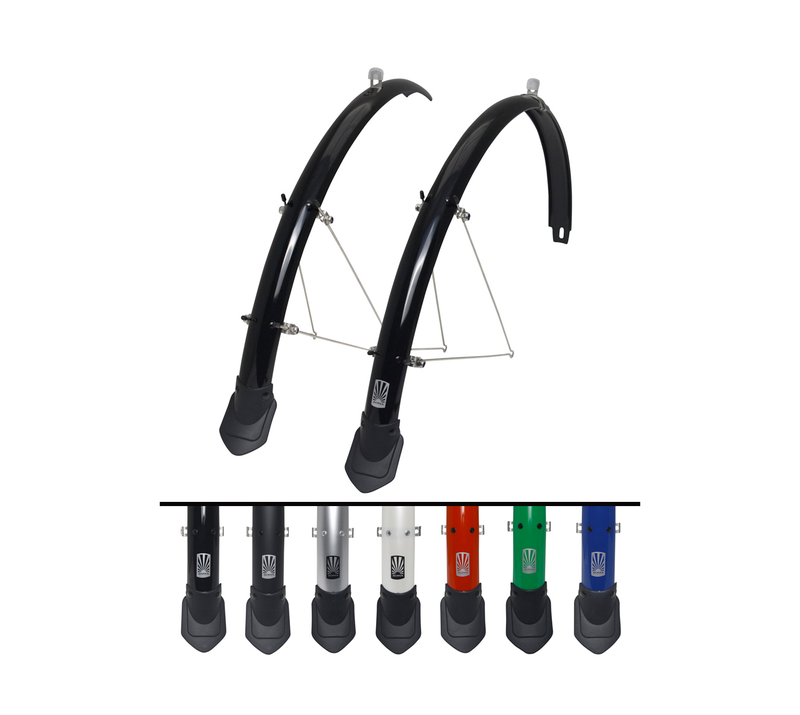 The Rain Dog fenders feature a deep mudflap that goes low enough to keep water spray to a minimum. And this is an important point, since some fenders in fact don't really hang down far enough, causing people to do things like improvising fixes using soda bottles attached to the bottom of the fender and whatnot to keep the spray down. 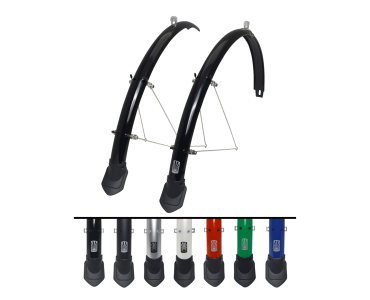 Summary: Soma Fabrication's Rain Dog fenders are a no-brainer choice for durable, rugged and affordable bike fenders. You'll be pleased with the way they look, and the 37 and 45mm widths come in multiple colors, including blue, red and green. $45.99 online or with specific pricing at your local bike shop.